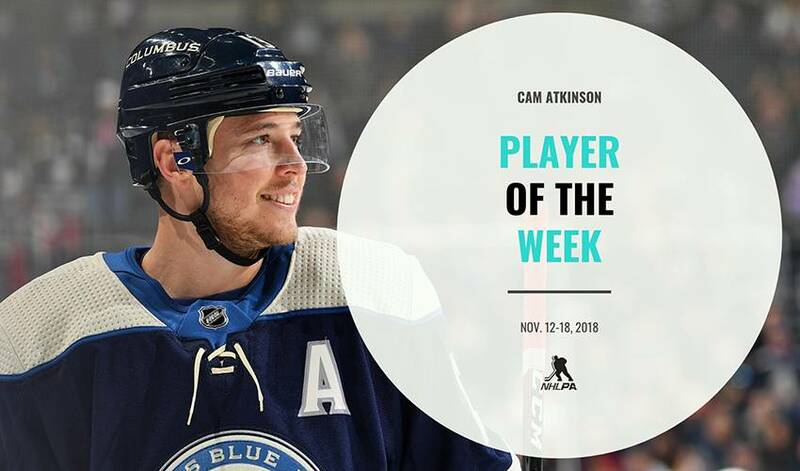 A career-high, the league-lead in points and a move up the Columbus Blue Jackets franchise leaderboard all highlighted Cam Atkinson's week – but he didn't forget to put in the work away from the rink. Atkinson (5-3–8) netted his fifth NHL career hat trick to move into a tie for the most in franchise history while setting a personal career-high with goals in four straight games, but also made time to visit local Nationwide Children's Hospital to deliver presents and smiles to sick children while sporting lavender jerseys in support of November's Hockey Fights Cancer initiative. "It's very important. Anytime we can put smiles on kids' faces, I think it goes a long way for them and their families," Atkinson said of the importance of the yearly trip. Atkinson’s eight points led the league in scoring for the week while his five goals tied for the most among all scorers. The alternate captain also leads his club with 12 goals on the season and is second in overall team scoring with 20 points. Atkinson started his week strong with having a hand in both goals scored by the Blue Jackets in their 2-1 win Monday night in Dallas. The 29-year-old opened the game's scoring on the powerplay before notching a primary assist with a cross-crease pass to teammate Pierre-Luc Dubois for the game-winning goal. "(Atkinson) made a nice play to bring it back around the net," Dubois, skating in his 100th NHL game, said postgame. "I was lucky enough to get a stick on it." Atkinson also registered four shots on goal and was named the game's first star – for the first time this week. The Blue Jackets headed back to Nationwide Arena Friday to play host to the Florida Panthers, where the team gave the home crowd reason to cheer with an outpouring of offence in a 7-3 win. It was Atkinson's short-handed tally that helped propel the Blue Jackets out of a 2-0 deficit in the opening frame, building to an impressive rally featuring a four-goal third period. "The shorthanded goal seemed to give us some life," said Blue Jackets assistant Brad Shaw, filling in for a sick head coach John Tortorella postgame. "The crowd got into it too, and the next thing you know we're up 3-2." "We're never out of the fight no matter if we're [down] two goals or three goals," Atkinson credited the spirit of his club to reporters. "We're a team that's a resilient group and can crawl back into it." As one of seven players to score for Columbus, Atkinson had five shots on net as he extended his point streak to three games with a second straight multi-point night to earn the game's first star once more. Columbus took to the road for a Saturday night matchup against the Carolina Hurricanes at PNC Arena. Atkinson extended his point streak to four games with a four-point night that included his fifth career hat trick to tie Rick Nash for the most in the Blue Jackets' record books. The club extended their point streak to seven games (5-0-2) as Atkinson was named the game's first star for the third time of the week. "It's funny how the puck keeps finding you," Atkinson tried to explain his string of success postgame. "I was trying to put myself in position in open areas. Wennberg made a [heck] of a sauce pass. I saw a little open lane and it just kind of went through [Darling]." Atkinson will look to extend his scoring streak to five games when the Blue Jackets take a 12-6-2 record to Toronto for puck drop Monday at 7:00 p.m. ET.